​What Are You Playing This Month? Sometimes it feels like the idea of a video game "dry spell" is a thing of the past. Other times, there really aren't that many new games and it's time to dig into the backlog. Here at the start of July, it feels a little more like one of those latter times. Then again, the game I'm playing the most right now is technically new. 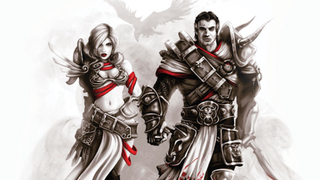 That would be Divinity: Original Sin, which I played a fair bit of when it was still in Early Access but now I'm playing the full game, and so far it seems pretty interesting. I'm also playing Fallout 2 a lot, because apparently I really wanted to play some old-school CRPGs. Other than that, well, I just built a totally new PC, so I'm still going through the backlog and enjoying watching games from 2013 and 2012 run at 60fps on ultra. Running old games on a new system may be one of PC gaming's richest pleasures. How about all of you? I've been enjoying keeping up with what you're playing each month, and I hope you're checking out some cool stuff in July.